The world of trading can seem fast-paced and hectic. However, contrary to how trading is sometimes portrayed in popular culture, it usually does not invoke instant wealth. Rather than the sporadic pushing of buttons, trading requires informed decision-making strategies. Trading is a broad term and covers a multitude of financial markets. For example, the markets for stocks, foreign exchange, exchange-traded funds, options and contracts for difference (CFD). Cryptocurrencies have added another element to traders’ portfolios, particularly with the advent of bitcoin trading. The process of trading and those involved have also changed and developed over time. The concept of trading has deep historical roots dating back to ancient Mesopotamia with the exchange of grain futures. Trading of financial instruments emerged through the exchange of debt amongst moneylenders in the 1300s, and their purchase of government debt. Following on, they began to sell debt to the first investors. Traditionally, those involved in the financial markets had considerable funds. However, the tides are changing in financial markets as cryptocurrencies present their opportunities. Both the modus operandi and the clientele of financial markets have evolved. The Internet and blockchain eras have respectively made trading more accessible to people all around the world. At the same time, they have opened up lower market entry levels in terms of capital requirements. Nonetheless, the spirit of trading remains the same. Trading is loaded with probabilities and it remains a risk whether the desired outcome will be achieved. Despite their differences, it's possible to be both a trader and an investor. Trading and investment have different aims and consequently, they follow unique strategies that set them apart. The primary difference between trading and investing relates to the timeframe over which assets are held. Investment implies a long-term commitment to assets, whereas trading generally implies short to medium-term involvement. Investors seek to gradually build profit through buying and holding assets for a long period of time, which is called hodling in the crypto world. Holding or hodling is a strategy that tends to defy the trends followed by traders. It means that regardless of price drops in the purchased assets, the investor will hold on/hodl on to the same portfolio and wait for the price to move up again. Securities such as stocks (shares in a company) and bonds (purchasing debt) are commonly known investment routes. Yet, investment is much more extensive. It also encompasses cryptocurrencies, real estate, investment funds, options, insurance, initial coin offerings (ICOs), Equity Token Offerings (ETOs), and more. Trading deals with many of the same assets as an investment. Nevertheless, the goals within the respective markets are different. Trading is essentially the pairing together of buyers and sellers of different asset classes. The focus lies on the fast accumulation of wealth. Traders are inclined to steadily follow news and price charts related to their assets. Consequently, they conduct thorough analyses to execute the best strategy. Trading mostly involves medium-sized trades, but larger trades also occur. Trading and investing carry the potential for the same outcomes. Within the fields, you may experience the following; a small profit or a small loss, a large profit or a large loss and finally, an insignificant outcome similar to the input price. In simple terms, bitcoin trading is the buying and selling of bitcoin. Bitcoin trading adds a new dimension to currency trading with its dynamic force and the volatility it experiences as it settles into the global market. The volatility (ups and downs) surrounding bitcoin trading creates the possibility to benefit from high yields. The aim of bitcoin trading is to capitalise on the opportunity to buy bitcoin when it’s price is low and sell bitcoin when it’s price is high. To really break it down, buying bitcoin at a low price means that you pay a low amount of fiat currency for a high amount of bitcoin. Selling bitcoin at a high price means that you receive a high amount of fiat currency for a low amount of bitcoin. As you can see from the price chart above, there were various swings in the price that created significant opportunities for success. Even as bitcoin’s price levels out, you can still make trading profits from the price changes that occur on a daily, weekly or monthly basis. Bitcoin trading mostly occurs on regulated exchange platforms. However, some traditional foreign currency exchanges are also incorporating bitcoin into their currency trading offerings. Similar to forex trading, bitcoin trading takes place on a 24/7 basis across the globe. Essentially, bitcoin exchanges are digital currency exchange platforms that create a marketplace for trading bitcoin to fiat currency and vice-versa. In the same spirit, many exchanges also offer the option to trade bitcoin and different altcoins for each other. These exchanges pair buyers and sellers with each other to enable an easy trading process and, tend to extract a small fee for their services. Major bitcoin exchanges include Binance, BitStamp, Coinbase, Kraken and ShapeShift. There is no single global price for bitcoin. Its price is determined by exchanges around the world. The price you pay for bitcoin is determined by the exchange that you choose to use. Exchanges typically show the bid price when buying bitcoin. The bid price or the buying interest is the highest price that someone is willing to pay on the exchange. The ask price or the selling interest is the lowest accepted price for a sale. The highest and lowest prices are derived from trends over 24-hour periods. Before getting involved in bitcoin trading, it’s necessary to familiarise yourself with the market and become aware of what moves bitcoin’s price. As already discussed in our academy article How does bitcoin work, the price of bitcoin should not be mistaken for the value of bitcoin. Bitcoin’s value is derived from the significance of its underlying technology - blockchain, its modus operandi and its benefits as a new method of transacting value across the globe. The price of bitcoin is determined by how much people engage with it, and how much people are willing to pay for it. Additionally, bitcoin’s scarce nature, which likens it to gold, will influence its price in the long-run. However, there are additional factors that contribute to the price fluctuations of the young market. 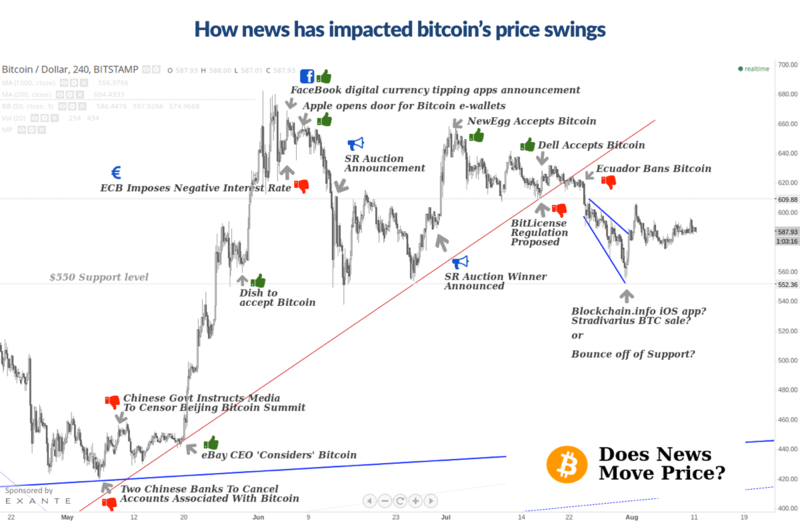 For example, within fundamental analysis for bitcoin, factors including scaling, media coverage, the integration of bitcoin as a payment method by major players, forks, and government regulation are regarded as crucial indicators in determining how price charts will move. Wherever you are, once you have an Internet connection and some disposable income, you can get involved in bitcoin trading. The Bitcoin revolution has broken down global barriers in the exchange of value and has made the global economy a more inclusive space. The low entry amount (of only a few Euros/dollars etc.) offered by some exchanges makes bitcoin an accessible asset. You don’t have to buy a whole bitcoin to get started. One bitcoin can be divided into 100 million parts (0.00000001 BTC). The smallest unit of bitcoin is called a “satoshi”. You can start by buying a small amount of bitcoin and practicing in order to familiarise yourself with the process. On top of the low entry level, exchanges do not usually charge excessive fees. Other than that, your transactions just need to include basic mining fees. Furthermore, there is no central authority involved in the issuing of bitcoin. New bitcoin is generated and awarded to the miner that found the new block of bitcoin transactions. A process called “halving”, detailed in the Bitcoin protocol, ensures that the block reward for miners is halved every four years. With its finite supply and the strict limits on the generation of new bitcoin, you can be sure that the market won't suddenly be flooded with new coins as can be done with traditional currencies. In conjunction, bitcoin's decentralised nature ensures that its price cannot undergo revaluation by certain individuals, but instead as a consequence of the market as a whole, following the laws of supply and demand. The volatility that bitcoin experiences as it gains popularity makes it an attractive investment and trading opportunity. There is strong potential to make high profit margins while trading bitcoin. Nonetheless, it’s also essential to consider potential risks within the overall realm of trading. Like investing in or trading any asset, bitcoin trading can come with risks and unfortunately, it’s possible to make mistakes along the way. Therefore, it is of utmost importance to carefully plan your strategy, stay up to date with the market, and conduct analyses. If you’re considering getting involved in bitcoin trading, you need to know your risk tolerance. 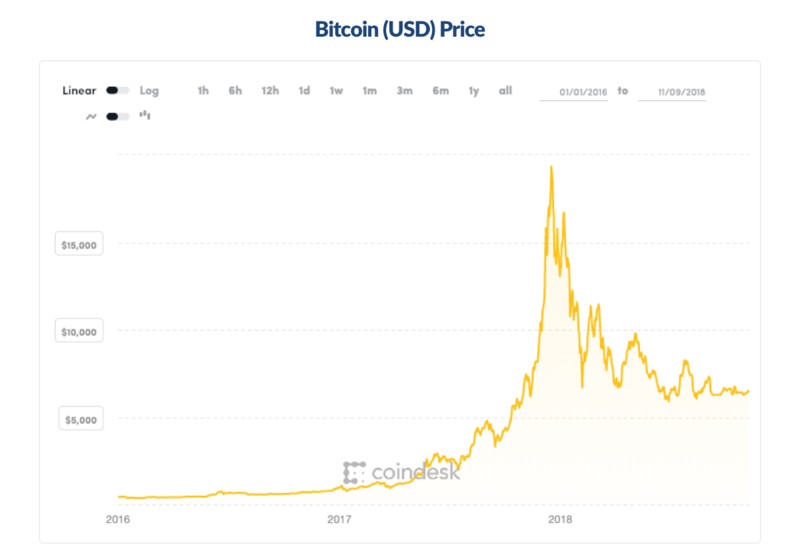 While it might seem clear, the hype surrounding the bitcoin market and the possibility to make large gains, should not encourage you to ever buy more bitcoin than you can reasonably afford while keeping your risk tolerance in mind. The market is young and volatile, and even though the volatility is what has created massive gains, it has also created some steep losses for those who were unlucky enough to buy/sell at the wrong time. Nonetheless, even without steep losses, as a trader, you’re bound to experience some minor losses once in a while. Additionally, it’s important to choose a well-known, security-oriented exchange platform. If you're planning to buy large sums, it is also advisable to explore more Bitcoin wallet options rather than leaving all of your coins on an exchange platform. For more information about Bitcoin wallets, you can take a look at this academy article. To conclude, the world of trading does not simply revolve around the sporadic pushing of buttons. It grounded in thoughtful strategies, that are designed to generate wealth through the art of exchange. First, you need to be ready to invest time and energy into learning about trading and how you would like to trade according to your risk appetite. Once you have an idea of a strategy, it could be useful to speak with a financial advisor or someone with experience to clarify any concerns and to provide you with feedback on your strategy. The opinions expressed in this article are those of the author and are not intended as financial advice. Investing in cryptocurrencies is highly speculative, the value of bitcoin and other cryptocurrencies is determined by the market. Thus, their value cannot be guaranteed and should never be taken as fixed, since there is a strong potential to incur losses as a result of volatility.